Mixing technical/progressive metal dexterity and elasticity with death metal/metalcore grit and vehemence, Canadian upstarts ONI offer one of the year’s more ambitious and adventurous debut albums. And that’s both a blessing and a curse for the sextet, who boast plenty of chops and guile, but fall into some familiar traps when it comes to restraint and finesse. 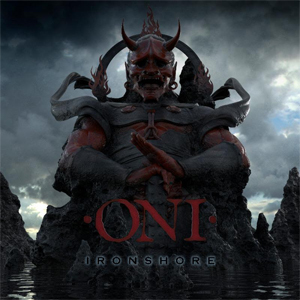 Recalling BETWEEN THE BURIED AND ME before it went full-on prog and got lost in meandering conceptual works, with a bit of DRAGONFORCE’s audacity, ONI offers a somewhat rough-and-tumble mishmash of its tech/prog/metal elements, which is one of Ironshore’s big strengths. The album rarely stays in one place for long, whip-sawing from nose-busting brutality to resonant melodic passages to full-on and sometimes protracted wankery to delicate atmospherics at the drop of a hat. Especially over the first few listens, this is one album that constantly keeps you guessing. But Ironshore also retains a relatively cohesive feel. The songs, for the most part, seem a sum of their parts and not just parts strung together - although a bit more traditional structure here and there might have provided a firmer foundation for frontman Jake Oni’s stellar clean vocal forays, especially on a song like “Chasing Ecstasy” with its glorious choruses. And despite all of the instrumental hijinx, and the complexity that comes with it, the band is surprisingly efficient, with the songs averaging less than five minutes per, the ponderous “The Science” excepting as its 11-plus minutes strain under the weight of its own indulgence. As the fourth song, it bogs things down just as Ironshore is building momentum and might have been better served either closing the album out or shedding half its length. This is one band that likes to noodle, and there are widdly-twiddly bass, guitar and “xylo-synth” - a keyboard played with mallets - bits all over the place that can prove something of a distraction, if not a downright annoyance a la the aforementioned DRAGONFORCE, during songs like “Coast To Coast”. So, at twice the average length, “The Science” is a chore to say the least – and not quite sure what to make of the stray, reggae-like aside at its midway point. But get past that and the rest of the album is pretty solid – “Eternal Recurrence” and “Thrive” are downright excellent. Ironshore’s many contrasts are effectively jarring, starting with the clean vocals that soar out of nowhere on the corrosive opener “Barnburner”, and the instrumental performances are impressive – if, again, occasionally overdone - top to bottom. LAMB OF GOD frontman Randy Blythe lends a hand on the djenty “The Only Cure”, his feral vocals engaging in something of a snarl-off with Oni, who can growl and scream with the best of ‘em as well. It offers some of the album’s most focused, heaviest moments - even with its xylo-synth blurpiness – to go along with the menacing “Spawn And Feed”. ONI certainly offers a lot to digest with Ironshore, and does an admirable job trying to make it all palatable. This very easily could have been so much pretentious, self-reverent twaddle, but the band shows enough muscle and smarts to offset its obvious technical proclivities – at least for the most part. And the better the band is able to achieve that balance down the road, the better one would hope ONI will be. Grab your copy of Ironshore in the KNAC.COM More Store right HERE.